I decided that the vivexotic viv Archimedes is in is too small. Yes its 4ft long but its only just over 1ft wide/tall. With this in mind I'm upgrading. I'm expecting the new tank at the start of Feb along with a new uvb setup. This means I'll be looking to get rid of both the vivexotic viv (only 6 months use from new-great condition except slight sand markings in the runners) and the Arcadia T8 starter for 36" tube. I can't recommend it as suitable for an adult beardie but it may be suitable for younguns or other reptiles you may have. I can put up pics for anyone interested. Is it 18"? in depth? front to back. 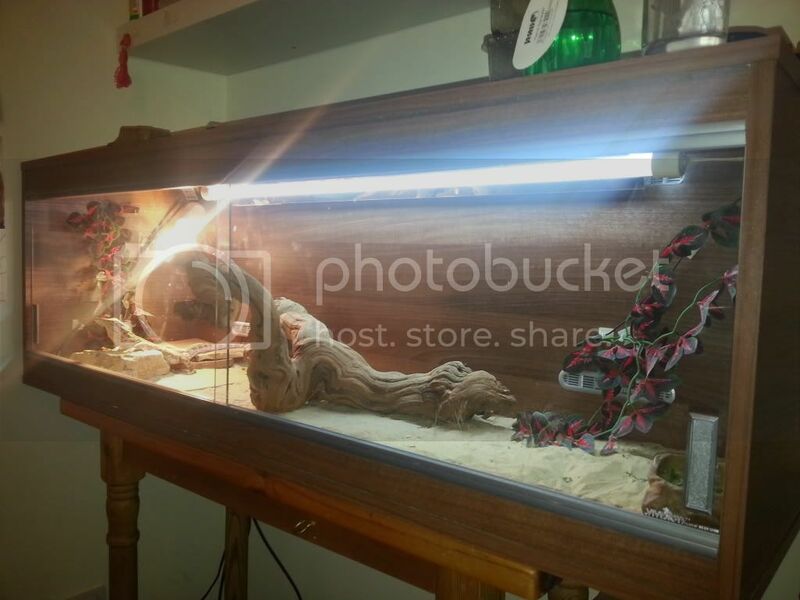 May be interested in it for my girlfriends corn snakes. How much are you asking for? I'll post the info tomorrow as well as having a think about price. Ok, where in Oxfordshire are you as I travel to Didcot fairly often anyway, so could collect. A little town called Thame, quite close to the m40 junction 8a. Ok, cool, well, depending on courier costs etc, possibly work out cheaper to just pick up. I think £50 would probably be a reasonable price. I'll clean and dissinfect it after the change over and can either leave it built or dismantle it. Oh and its in fact only around 15" wide and tall but 4ft long. Would you be able to send me a pic? I think dismantled would be best if that's not too much bother! Dismantled is fine, no problem. However its still occupied...I'm expecting the new viv on the 6th of Feb so after I've assembled it and rehomed my lil guy I will let you know if that's ok? Ok, cool beans, prob won't need it till March anyway, but will let you know if I find a different one, but size sounds ideal and price is good too. I added handles to the glass, it will also have a few screw holes where lights were fitted. Nice to meet you. Hope the viv serves you well.